Two drivers from New Zealand shared the victories at Tasmania SuperSprint at Symmons Plains Raceway, the third round of the 2019Virgin Australia Supercars Championship. Scott McLaughlin (DJR Team Penske Ford) triumphed for the sixth time this season on Saturday while Shane van Gisbergen (Triple Eight/Red Bull Holden) climbed to the top podium spot after Sunday’s race. In the first race, which Mark Winterbottom started from pole in IRWIN Racing’s Holden, Scott McLaughlin took the lead at the start in the #17 Shell V-Power Racing Ford Mustang and stayed in front for 50 laps, ultimately finishing 1.7637 seconds ahead of his teammate Fabian Coulthard in the #12 car. Winterbottom finished fourth, losing his podium spot in the closing laps to Shane van Gisbergen. With the Tasmanian victory, his first ever at Symmons Plains Raceway and 31st Supercars win in a career, Scott McLaughlin confirmed his fantastic form at the start of the season, taking six wins in six races he started, missing one race due to a bizarre accident at Albert Park. Jamie Whincup, who came to Tasmania as the second-placed driver in the championship, started 15th after he spun in qualifying. His weekend got worse in the race when he collected a puncture that forced him to pit. He dropped two laps down after checks for steering damage, eventually finishing 25th and dropping to P4 in the championship. On Sunday, Shane van Gisbergen converted his pole position to the first win of the season both for him and Holden Commodore, after seven consecutive wins of Ford Mustang. 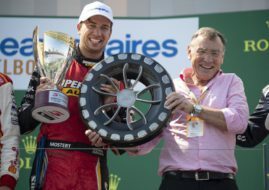 It is his 32nd Supercars win in a career. SVG has won the 84-lap with 5.1877-second gap ahead of Fabian Coulthard. David Reynolds (Erebus/Penrite Racing Holden) completed the podium. The championship leader Scott McLaughlin finished the race in the fourth place. Now, he holds the lead with 770 points, 124 points more than his teammate Fabian Coulthard. Jamie Whincup, who finished fifth in the second race, is third in the championship, 36 points behind Coulthard and six points ahead of Shane van Gisbergen. The fourth round of the 2019 Supercars season would be the Phillip Island SuperSprint on next weekend (April 13-14).